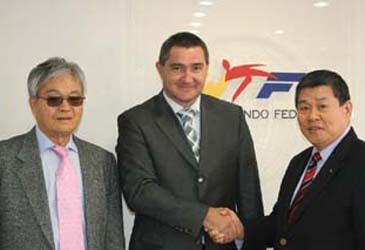 WTF Secretary General Jin Suk Yang shakes hands with Dr. Sinisa Jasnic (center), vice president of the Organizing Committee of the 2009 Belgrade Universiade, shortly after agreeing to include taekwondo poomsae on the official program of the 2009 Belgrade Universiade at the headquarters of the WTF in Seoul on Feb. 24, 2008. At left is Dr. Ken Min, chairman of the WTF Legislative Committee. Taekwondo poomsae will be on the official program of the 2009 Belgrade Universiade, along with kyorugi, said a ranking official from the Organizing Committee of the 25th Summer Universiade on Feb. 24, 2008. 'I make an official promise that poomsae will be on the official program of the 2009 Belgrade Universiade along with kyorugi,' said Dr. Sinisa Jasnic, vice president of the Organizing Committee of the 2009 Belgrade Universiade. The 25th Summer Universiade is scheduled for July 1-12, 2009, in Belgrade, Serbia, and taekwondo kyorugi competition is set for July 1-5. Mr. Jasnic and WTF Secretary General Jin Suk Yang had a meeting on the poomsae issue at the headquarters of the WTF in Seoul. The idea of putting poomsae (fixed movements of taekwondo or form) on the 2009 Belgrade Universiade program was first proposed at the 2nd International Taekwondo Symposium in October 2007 at the University of California, Berkeley, the United States. The symposium was cohosted by the UC Berkeley and the Taekwondo Promotion Foundation in Korea. 'During the seminar, Dr. Ken Min, co-chairman of the Organizing Committee of the symposium, proposed the idea to include poomsae on the program of the 2009 Universiade, and FISU President George Killian and I accepted this idea,' said Mr. Jasnic. To further promote taekwondo, the WTF launched the inaugural WTF World Taekwondo Poomsae Championships in Seoul in 2006 and the second poomsae championships in Incheon, Korea, in 2007. Mr. Jasnic, who also serves as an assessor of the Executive Committee of the FISU (International Univeristy Sports Federation), arrived in Korea on Feb. 23 for a four-day visit on his way to Harbin, China for a FISU Executive Committee meeting scheduled for Feb. 27-March 1. Since the 2003 Summer Universiade in Daegu, Korea, taekwondo has been adopted as an optional sport at Summer Universiades, including the 2005 Ismir, Turkey, Universiade and the 2007 Bangkok Universiade. Besides the 2009 Universiade, Belgrade is host to the 10th World Unversity Taekwondo Championships on July 16-20 this year. Expressing great satisfaction with cooperation with the WTF, Mr. Jasnic, who works as chairman of the CTI World University Championships, asked for WTF support for technical matters for the success of the upcoming World University Taekwondo Championships and the 2009 Belgrade Universiade. 'Our cooperative relationship is really excellent and I appreciate all the support from the WTF,' said Mr. Jasnic, who arrived in December 2006 to sign a collaboration convention between the WTF and the FISU.